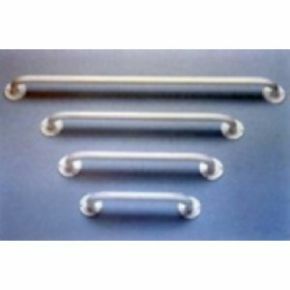 These grab rails are manufactured in 1” (2.5cm) diameter steel tube and are plastic coated. They have a circular fixing plate with 3 fixing points per plate. We were impressed with the paint finish of the product and the fact that it had a rubber bung at each end to stop water getting into the hollow of the tube.The strength of the rail is essential to its use and the weld each end is excellent. From a fitting and age usage, the only extra I would like to see with all items to be fitted outside, is the instruction to use stainless screws and a rubber backing to be fitted under the two end pieces. This stops the paint chipping when the screws tighten up the rail to a wall and the paint is punctured by the unevenness of the wall. Rust runs then appear and the wall has to be redecorated and the metal touched in with new paint.